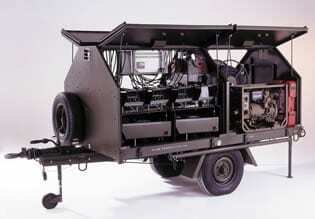 A trailer mounted, portable airfield lighting system designed to support both covert and non-covert operations. MOSKIT is the only portable airfield lighting system able to fully comply with NATO STANAGs 3534 and 7025. 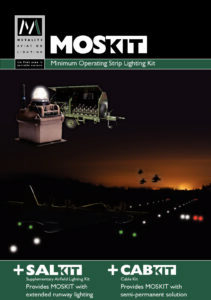 MOSKIT is a stand-alone portable airfield lighting system designed to support strategic air operations from unconventional and unimproved surfaces. The edge lights, approach lights and PAPIs contained within the MOSKIT trailer can be deployed in less than 20 minutes to form a 1500m minimum operating strip as defined by NATO STANAG 3534. The system is suitable for both fixed and rotary wing operations and is typically used at forward operating locations, on temporary and reserve airfields, to mark helicopter landing zones and where permanent airfield lighting systems have been damaged. MOSKIT is in service with many countries around the world, these include NATO member countries as well as non NATO countries including Africa, the Middle and Far East. It was first tested by the UK RAF in the Middle East during Operation Desert Storm and went on to support Operation Bolton throughout the enforcement of the no fly zones in Iraq. Later it was used in both Kosovo and Bosnia and also during evacuation missions in Sierra Leone and the Congo. More recently, both the UK RAF and the US Marines Expeditionary Forces have used MOSKIT in Iraq during Operation Iraqi Freedom with the US Air Force deploying it in Afghanistan to support Operation Enduring Freedom. Our case studies section gives in depth examples of how the MOSKIT portable airfield lighting system is currently being used to support airfield operations around the world. Hitch (coupling) Hydraulically damped overrun mechanism. Fitted with 76mm NATO EYE as standard (others available), plus over-centre hand brake.